The card is truly beautiful and the sentiment is really fitting. I’m sure it will bring comfort. Thank you so much for sharing it on your blog. It’s a lovely card and a lovely sentiment and I’m sure it will be greatly appreciated. You’re such a good person and I’m so lucky and proud to be able to say that you’re my friend!! 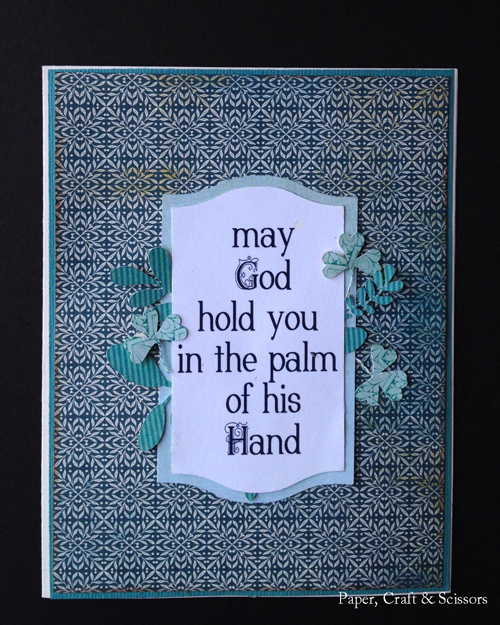 This card is beautiful Sis and it is very thoughtful of you to create for him and to share with us. Enough said. Your card is beautiful, perfect in appropriateness, and makes me smile and tear up all at the same time…..kind of like my wonderful, but difficult job. Thank you so much for the kind words. I was surprised and touched to read them. I hope your friend gets the very best care from a skilled and caring nurse. I hope he has time to laugh, to cry, to get angry, to make peace, and to tell the stories about himself that others need to know. And I hope that he lives, every second he has, and he feels it. No greater honor known than to assist a soul in entering or exiting the world…and that is done more by that soul’s family and friends than by a nurse. You’ve started well, my friend. Keep being you. And let him keep being him. Much love to you both. This is another really hard card to make for someone. I love that you shared it because this is really quite perfect in style and sentiment–will definitely be one to bookmark. I am sure your card is a comfort to him and to his family. Always a difficult time and kindnesses are always welcome.